This mod allows map makers / server owners to change the respawn point & dimension of dimensions. In the general section there is currently only one property you can set which is "initialSpawnDimension". This sets the dimension where a player who has never logged in before spawns initially. This config would cause players to initially spawn in the nether when first joining the game. The rules array can contain multiple rules which control the settings for different dimensions. appliesTo: An array containing either dimension ids / names of dimensions types / full class names of world providers. This controls what dimensions this rule is applied to. "*" can be used as a special element of appliesTo which will apply this rule to all dimensions. canRespawnHere: Whether players can respawn in the dimensions this rule applies to. canSleepHere: Whether players can sleep in the dimensions this rule applies to. (If canRespawnHere is set to false this has no effect). This also allows sleeping in dimensions where you generally can't sleep (Like the Nether / End). spawnPoint: The position at which players will spawn in this dimension. Rules that come later in the rules array override values of rules that come earlier. This changes the initial spawn dimension & the respawn dimension of all dimensions to the nether. It also moves the spawn point of the nether to "x: 5, y: 84, z: 10" and allows players to change their spawn point in the nether by sleeping. With this players will initially spawn in the end at "x: 23, y: 40, z: 10". Once they die they will respawn in the overworld at "x: 9, y: 100, z: 0". When they die there they will respawn in the nether at "x: 500, y: 40, z: -500". Dying in the nether will just respawn them back at "x: 500, y: 40, z: -500". It isn't possible to sleep in the nether / end / overworld. Please post about bugs on the github issue tracker and not on the curseforge post. Also make sure your json is valid before creating a bug report. This mod allows map makers / server owners to set the exact spawn point of a world. You can also specify the start dimension. This config file sets the spawn point to X:50,Y:70,Z:60 in the end, enables beds, spawn protection and forces an exact spawn. If you create a file you always have to specify spawnX,spawnY,spawnZ and spawnDimension. exactSpawn, spawnProtection and forceBed are optional and default to true. "exactSpawn" : Specifys whether players will respawn exactly at the specified spawn point. "spawnProtection" : Allows Spawn Protection in changed spawn dimensions. A PerfectSpawn.json in a world directory overrides the one in the main dictionary. You can use the command "/ps reload" to reload all config files and apply them instantly. 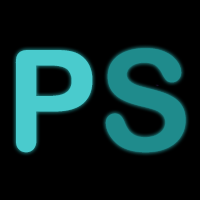 This mod class transforms all WorldProviders it finds, if you get a crash that only happens while using PerfectSpawn come to me first! 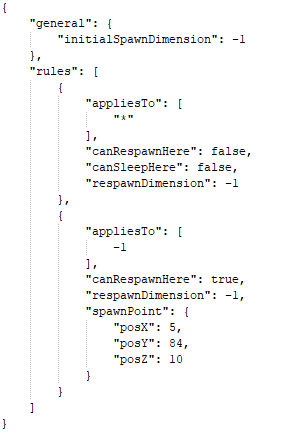 Instead of creating the json files manually you can also use the /ps set command to change the spawn ingame. If you wanna add Perfect Spawn to a modpack / ship it with a map feel free to do so. It's your .minecraft folder / the folder where your server files are located. 1. I would like to be able to use just the exactSpawn setting to turn of vanilla's spawn scatter, while still allowing the world spawn point to be set as a part of normal terrain generation. In a perfect world I'd be able to specify scatter distance as an integer, and guarantee that players land within e.g. a 7x7 area instead of the larger area provided by vanilla. 2. I would like to be able to use the spawnDimension and forceBed settings without specifying coordinates, so I can, e.g., start players in the Twilight Forest but again without having to pregenerate terrain, so it's all different every time. Shorter: is X,Y,Z required for technical reasons, or can it be made so we can decline to override them? Can a configurable spawn fuzz value be added? Would it be possible to set separate spawn points for players that die in the overworld and ones that die in the nether? Also, is there a way to allow beds in all dimensions as a global setting? I guess i could make like an advanced mode where you can create config files for every single dimension where you can specify their spawn dimension individually? Is there a command that can be used to set the spawn with this mod? I've been trying to make a fairly in-depth modpack map, and if there was a command for it, that would make what I need to do a lot easier. In 1.8 there is, in 1.7.10 there isn't right now. Really, all you need to do is push F3 in game, and then find the X, Y, and Z coords. Just enter that into your json file thing. When using /respawn all items are lost. Can this be changed ? Because people can build at the spawn point? The problem is that the first spawn did spawn in blocks. 1. Take the exact X/Z location specified. 2. Find a Y location there that has air blocks, if possible at/near the specified Y. In other words, vanilla spawn will say "Find the highest point in this column". The first time spawning with this became "Use this exact spot". Is that an issue though? You generally don't want players spawning in blocks right? There is a bug in the Y level spawn determination. If you have exact spawn set true, then your first spawn into a world is at the Y level specified -- even if someone has built at that location. Respawning after death is on the surface/top of what was built. I just noticed: you say "server dictionary", or "world dictionary". I think you mean "directory". 1. I look for things in the config directory, not the main directory. 2. Sure, if I remember to come here and check, I can see the file template. But I start by assembling the mods that I want to use, run the server, and stop it; then, tweak config files, toss out the old world, and restart. Check how it works/looks. Repeat. Lack of a config file to play with made me first wonder if I had the mod installed right, and then a search to find the docs page here. 1. Since the PerfectSpawn.json file configures a vanilla mechanic i felt like it was better located in the main dictionary. 2. But why? :P If you use this mod you generally wanna set the spawn to a specific location you have in your head. You can just copy the example config file of the post can't you?